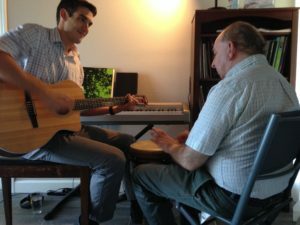 Music Therapy (MT) is an established health-care profession that applies music-based interventions within a therapeutic relationship to address social, emotional, behavioral, physical, and cognitive needs of individuals. 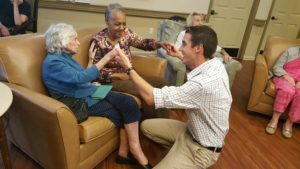 Whether in one-on-one sessions or large groups, we assess the strengths and needs of each client, and provide innovative and effective treatment including creating, singing, moving to, and/or listening to music. 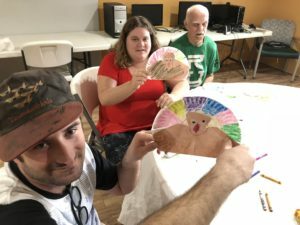 Through involvement in this unique therapeutic context, people feel accepted, understood, and motivated; they make real change in non-musical domains of health and well-being; and their strengthened abilities are transferred to other areas of their lives. Our board-certified music therapists assess emotional well-being, physical health, social functioning, communication abilities, and cognitive skills through musical responses; design music sessions for individuals and groups based on client needs using receptive music listening, lyric discussion, song writing, music improvisation, music performance, music and imagery, and learning through music; and participate in interdisciplinary treatment planning, ongoing evaluation, and follow up. Music Therapy St. Pete, LLC (MTSP) can improve health outcomes and increase patient satisfaction for medical hospitals, support groups and organizations, oncology clinics, medical day-care centers, memory-care floors and general nursing homes or skilled nursing facilities, day centers for adults with intellectual disabilities, schools and aftercare for children with special needs, neuromuscular rehabilitation facilities, hospice programs, community mental health centers, drug and alcohol programs, home health care, and most clinical settings. MTSP invites you to our home studio, and we travel across Pinellas and nearby counties to visit your loved one or organization. Although most people have very strong, positive responses to music, some will prefer alternative modalities, and we want to ensure that everyone receives the best care possible. Therapeutic training and success-oriented facilitation informs our yoga and mindfulness practice, art classes, dance lessons, choir programs, academic tutoring, and more. We accommodate diverse interests and abilities when designing complementary and integrative medicine programs. Reach more patients and improve their holistic well-being through the creative arts! Music Therapy is all about using music interventions to accomplish nonmusical outcomes. Traditional music lessons use musical expertise to teach musical skills. But what about using clinical insight and therapeutic skills to overcome unique physical or mental obstacles to help EVERYONE succeed in their musical goals? MTSP is proud to offer Adaptive Music Lessons! We assess physical limitations to enable successful performance through innovative equipment. We can accommodate auditory, visual, tactile, and social sensitivities. We are therapists first, and therefore trained to support those with special needs. We are inclusive, compassionate, and excited to teach music!